Right around March, my body starts craving fresh, raw veggies. We are pretty seasonal eaters in our house, so with the winter comes less variety to my veggie rotation – and I think that is a good thing. Cooked veggies (with friendly fats like butter) are easier on our guts to digest, and it is good to give our bodies a break from foods while we rotate with the seasons! 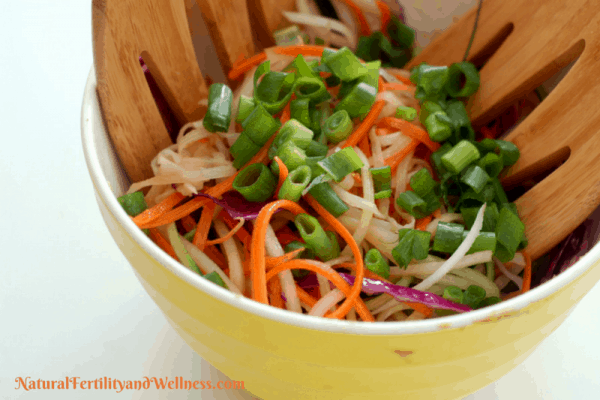 Come spring – bring on the salads…especially this Asian salad. 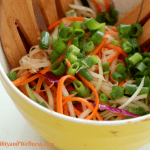 While I am still a good couple months away from fresh salad greens in my garden, I do have access to some nice late winter and early spring vegetables that make a really great raw “slaw” type salad. 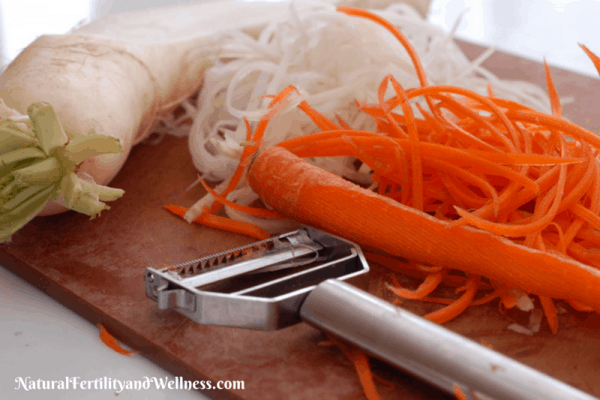 Just a simple julienne peeler is all you need (the spiralizers work too if you have one) and you will have colorful strips of veggie that really feel like a noodle indulgence. 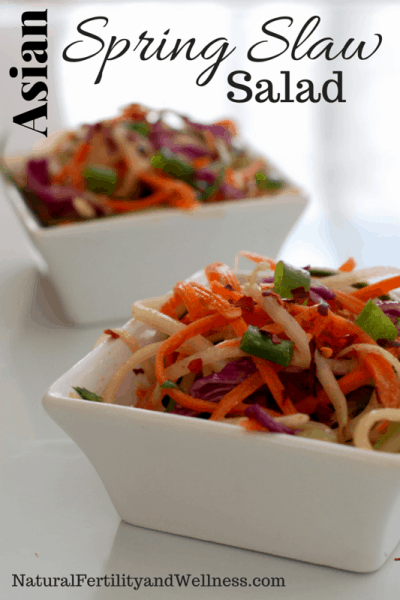 I am a big-time Asian cuisine fan and a couple of years ago I put a twist on my Thai peanut sauce and made a salad dressing – it is one of my favorites and it really dresses up this slaw type salad so nice! This salad makes a fantastic lunch since it is filled with satiating friendly fat from the dressing. You can add chopped nuts/seeds or chicken/tuna to your bowl for added protein if you want as well. 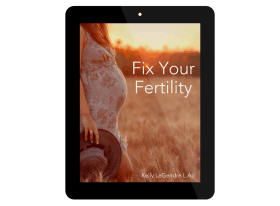 Put the dressing in the bottom of your salad bowl. Add the veggies and toss with the dressing. Add your garnishes if you want! Note – the salt in the dressing will pull the moisture from the veggies over time – if you are packing it up ahead of time it would be a good idea to pack the dressing separately and add it to the salad upon eating. Green cabbage works as a substitute for purple cabbage.